This 1860's light and bright 2 bedroom row cottage close by vibrant O'Connell Street is fully furnished with quality contemporary furnishings and all the modern amenities, including dishwasher, r/c A/C in lounge room, washing machine/ dryer, LCD TV/DVD/Soundbar. There is a selection of books, DVDs and toys for the children. The cottage is renovated with an up to date quality kitchen with 900mm stainless steel gas cook top and electric oven, dishwasher, modern bathroom with bath, double vanity, double shower and washer/ dryer. The kitchen, lounge and bathroom all outlook onto a small private courtyard. There is also a courtyard at the front of the property providing a private outlook for the master bedroom. Travers Row is located in a quiet no through lane in North Adelaide, only minutes walking distance to some of the best cafes, restaurants, art galleries, parklands, playground and interesting shops on O'Connell Street. It is close to the CBD and public transport is readily accessible. Other attractions nearby include the Adelaide Oval, Festival Theatre, River Torrens Parklands, Adelaide Zoo, Botanic Gardens, art galleries, the National Wine Centre, golf courses and Adelaide aquatic centre and playground. There is no need to hire a car with the free city loop bus to take you to Rundle Mall, Central Markets and other great city locations. Two bedroom 1860's row cottage with quality contemporary furniture and fittings, located in a quiet no through lane in North Adelaide, close to the CBD, galleries, parklands and walking distance to North Adelaide's most popular cafes, restaurants and pubs. Sleeps up to four adults (1 x queen size bed and 1 x double bed). Comfortable surroundings and reverse cycle A/C in the lounge room and ceiling fans in the bedrooms are just a few of the benefits that create a comfortable and quiet place to unwind. The little cottage is great in the fantastic location, but in my professional opinion the owners need to address the slippery floor in the shower (real OHS issue). Very clean, nothing was neglected. Handy to North Adelaide & O’Connell Street. Parking is an issue - walk to end of street - permit parking all night. Outage is under the flight path for airport so that was a shock on first morning. Bathroom excellent other that under shower - little slippery under foot, a nonslip mat would help. Beautiful home, lovely lay out and amentities. Clean and with a lot of character. Sophie was a fabulous host. Stayed in contact and made check in very easy. Beautiful home centrally located. 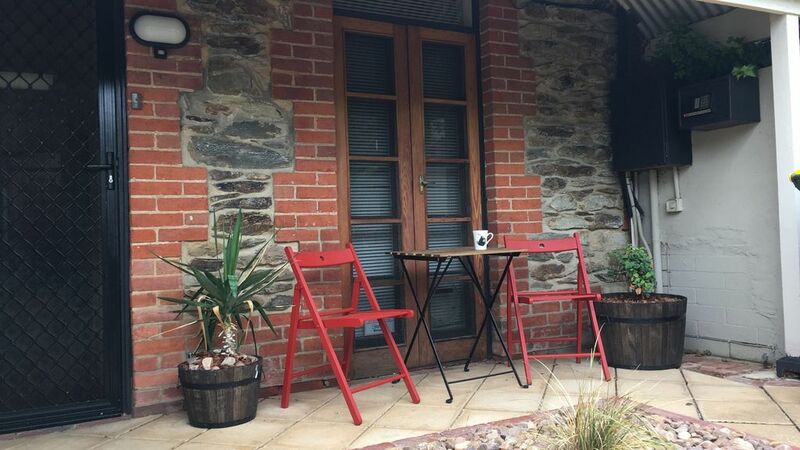 This cottage is in a lovely lane in North Adelaide; close to restaurants, cafes, opposite the swimming centre and within walking distance of Adelaide Oval. It is comfortable and the bedrooms are spacious. The bathroom is lovely. The only thing missing is a coffee plunger. We have stayed here twice and will again. The owner is always prompt to respond to messages.